A mixture of rock scrambling, climbing, and walking over adventurous terrain through inspiring landscapes. 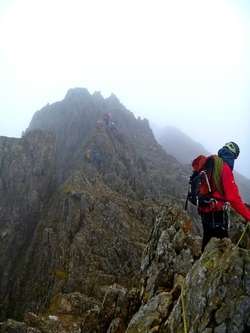 The Lake District is an ideal place to try mountaineering, with many route choices at all levels of difficulty. The Langdale, Patterdale, Borrowdale, Eskdale, and Wasdale valleys all offer superb days out of this nature. So wherever you're staying in the Lake District, there are some amazing adventures to be enjoyed nearby. We would typically begin with a short walk-in and climb an easy rock climbing route. This would lead us onto scrambling terrain with some route finding decisions to make before arriving at a rocky buttress for more scrambling or climbing taking us up to a Lake District summit. Whilst high in the fells we may continue over more summits before returning to the valley base. These days are available all year round.